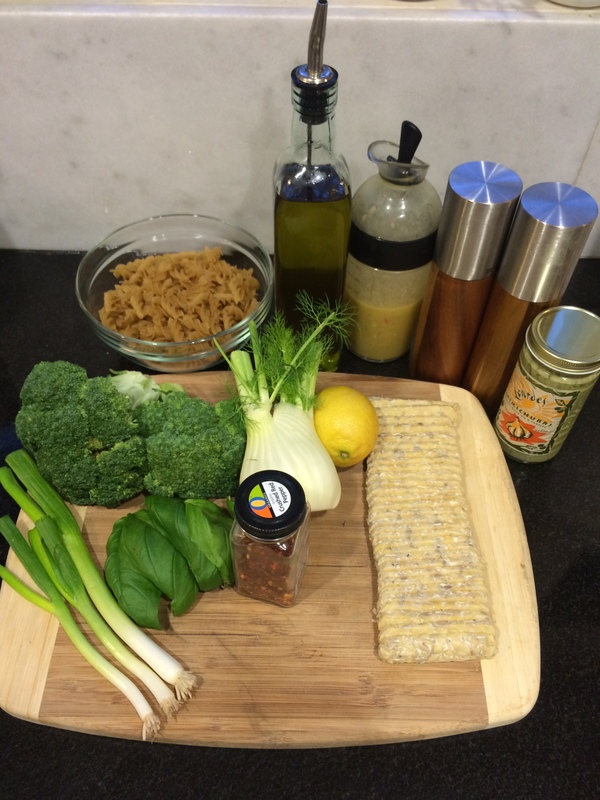 Tempeh is a delicious soy product that can be marinated and grilled in place of meat or fake meat. It is a much cleaner form of protein than fake meat. It is simply cooked soy beans that form a white block during a fermentation process. 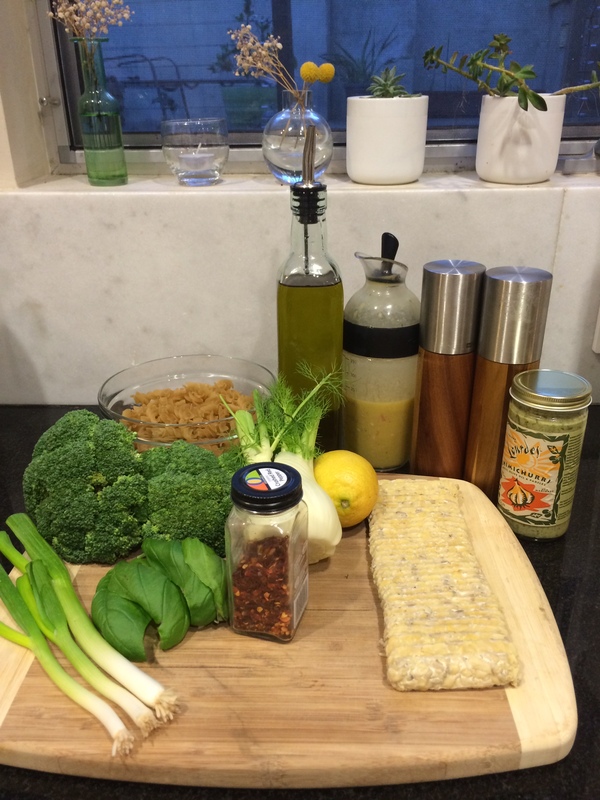 I recently had a request for a tasty Tempeh recipe, here is what I concocted… It takes some time but is worth it to fully marinate the tempeh. It is amazing served with home made Peanut Sauce and Steamed Vegetables. The Peanut Sauce is my mom’s recipe, it is so tasty up will want to lick the pan! 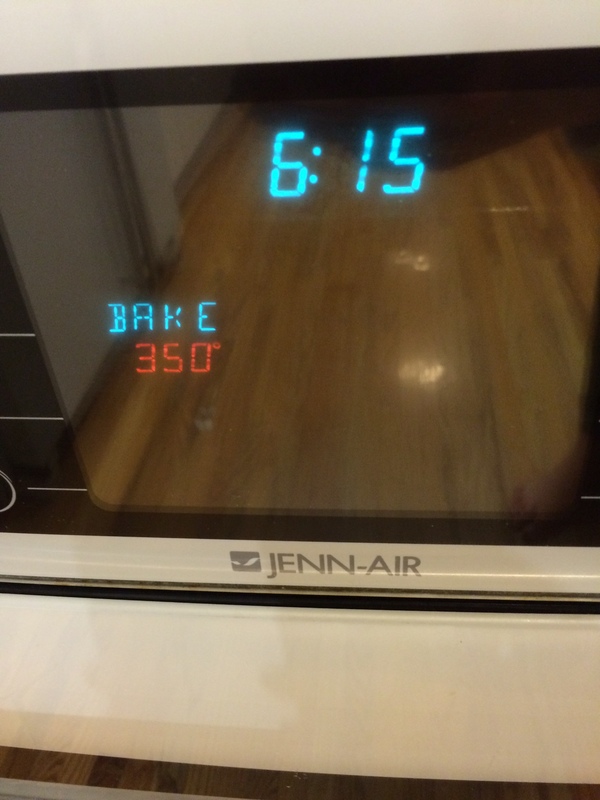 Preheat oven to 250 degrees. 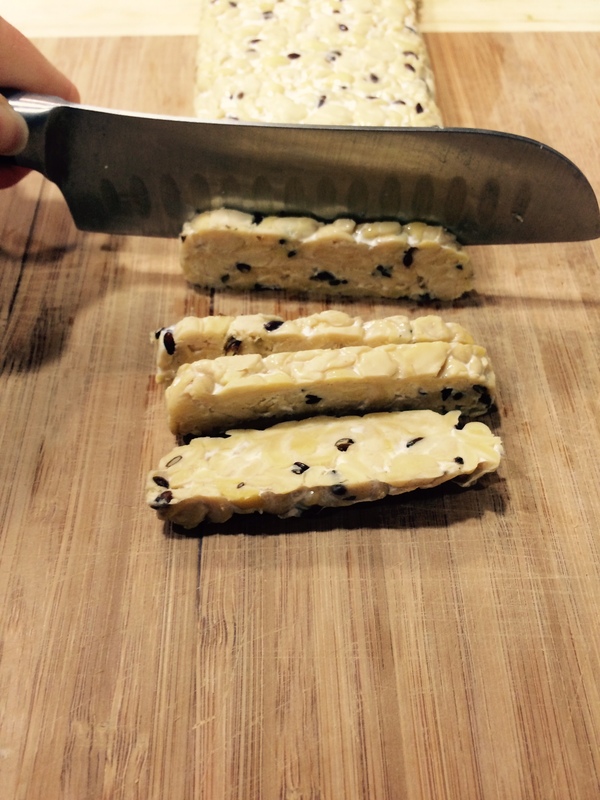 Cut tempeh into 1/4 Inch Slices and place in a glass baking dish preferably with a cover. Add Cumin, Curry Powder, lemon juice, Braggs Liquid Aminos, Toasted Sesame Oil, diced fresh ginger. 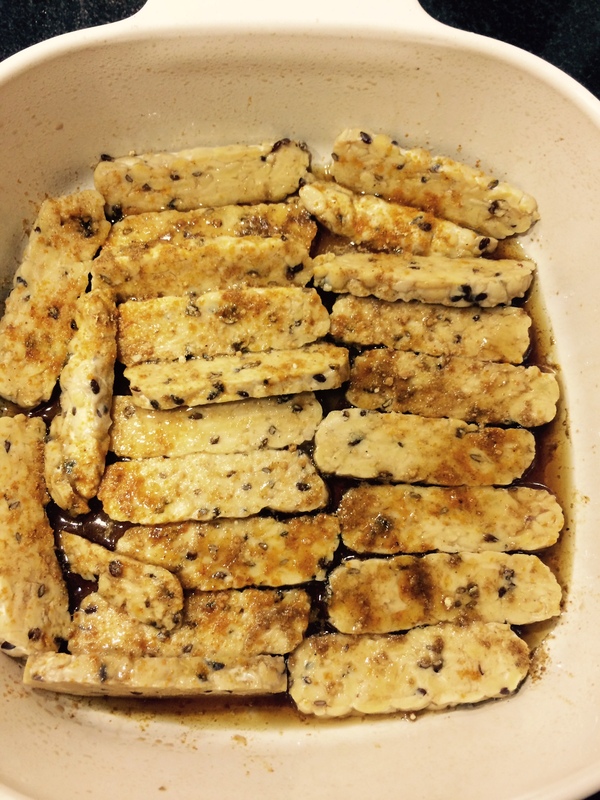 Mix ingredients with tempeh, make sure each piece of tempeh is being marinated. If it looks too dry, add more toasted sesame oil and Braggs. Place in oven and cook on 250 for one hour. This will ensure that the tempeh will marry with the spices. While the Tempeh is cooking prepare the peanut sauce and vegetables. After one hour, put a sauté pan on medium heat, add olive oil. 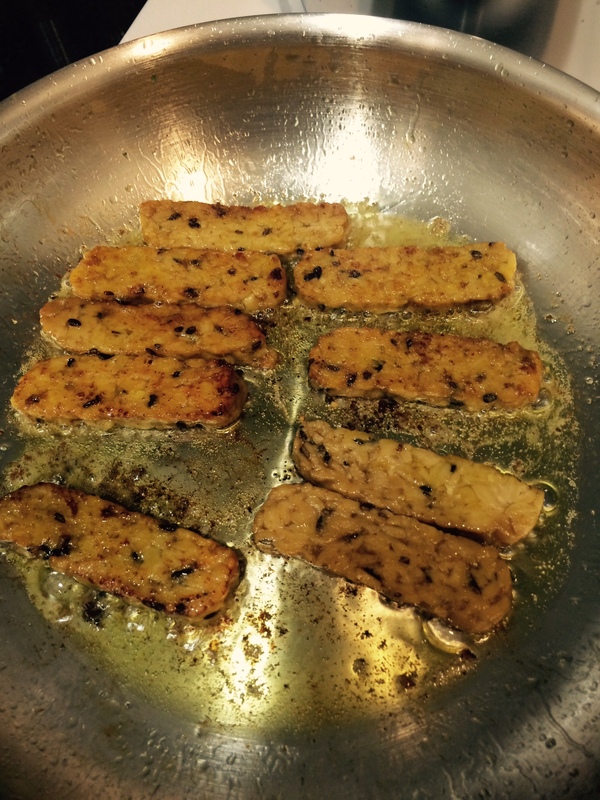 Fry each piece of tempeh until golden brown. If you are on a strict diet you can skip the frying party, but it won’t be quite as delicious. Place on paper towel and get ready to serve. Place all ingredients except cilantro and red peppers in a medium sauce pan, turn heat to medium low. Let simmer, stirring occasionally. after 20 minutes or so the sauce should thicken and begin to smell good. At this time add cilantro and desired amount of red chili flakes. If you can handle the heat, add more chili peppers. They go a long way, so don’t over spice. Continue to simmer until cilantro has blended in. 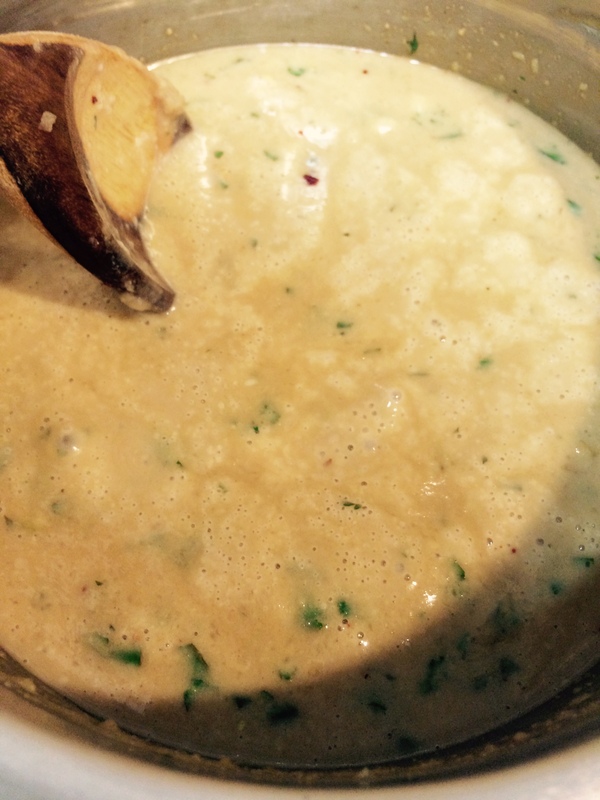 Voila, you have delicious Peanut Sauce, great for all Asian inspired dinners. It is packed with protein and good fats! Dark Leafy Greens such as Kale or Spinach, washed, and chopped. Chop all vegetables. Place in Large Saute pan or wok. add 1/4-1/2 cup of water. Cover for 10 minutes or until water is evaporated. Depending on how you like your vegetables, pour more water and steam for longer. I personally like my vegetables to have a little crunch to them. 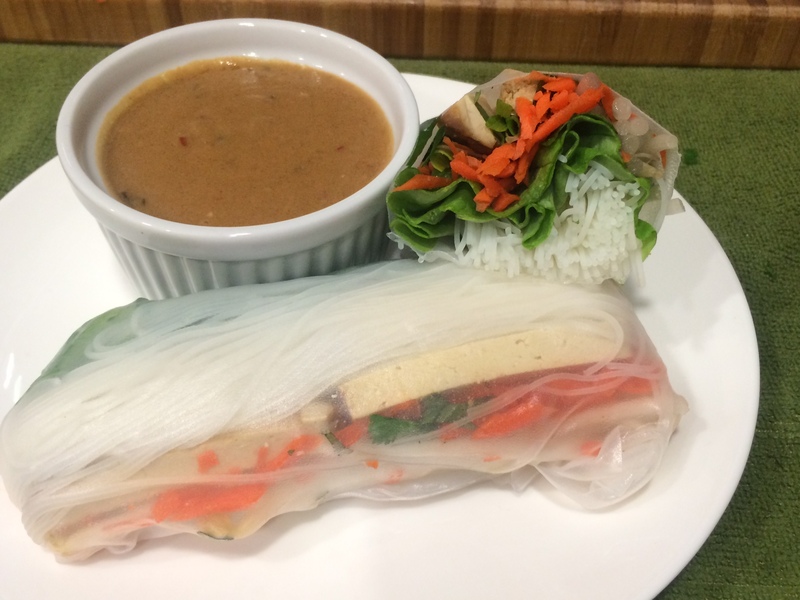 Serve with the delicious Tempeh Slices and Peanut Sauce. ENJOY! One of my favorite dinners to make is stuffed peppers; they are so fun to make, because you can get creative and add whatever vegetable, grain, or delicious morsel you desire to the filling. If you are a meat eater, you can add chopped up sausage for an extra protein punch. Vegetarians will get their full dose of protein when using Quinoa, because it is a complete protein! 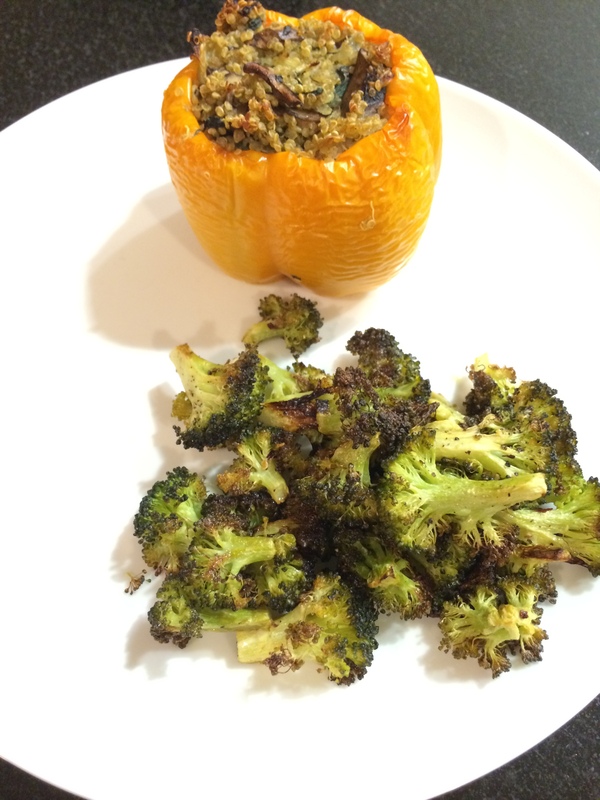 Stuffed peppers are very filling and are great served with a small salad or delicious crispy Roasted Broccoli. 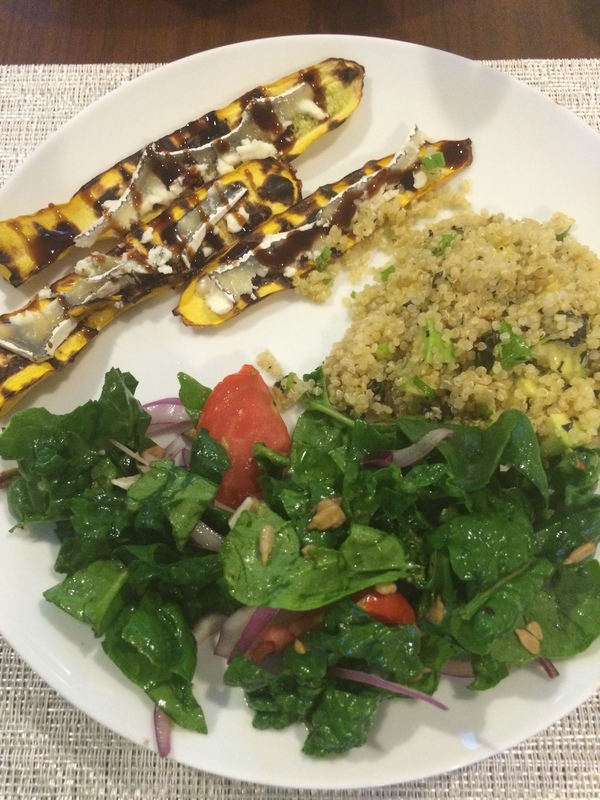 Enjoy this delectable plant based recipe; get creative and have fun in the process. To make Quinoa, follow instructions on the package, substitute water for vegetable stock to add flavor. Add coconut oil, salt and cumin to boiling liquid. 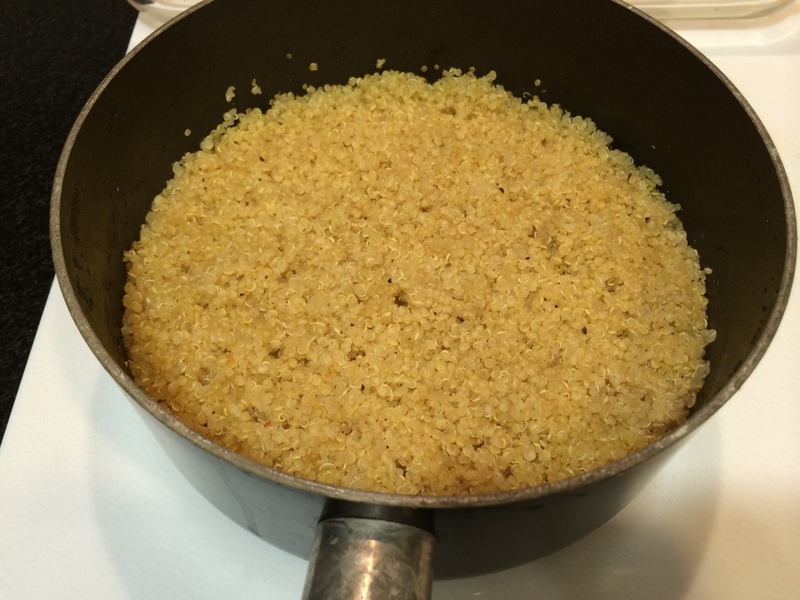 Make sure all moisture is absorbed into the quinoa. Fluff and set aside. Wash peppers and cut off the tops and cut a little bit off the bottoms so the peppers can sit upright. Remove seeds and pepper innards. Set Peppers aside. Sauté mushrooms,spinach and onion in olive until slightly soft, chop tomatoes and olives. With a wooden spoon, fold everything into quinoa mixture. Add lemon, salt, pepper and olive to taste. Feel free to substitute or add different vegetables/beans into quinoa mixture. 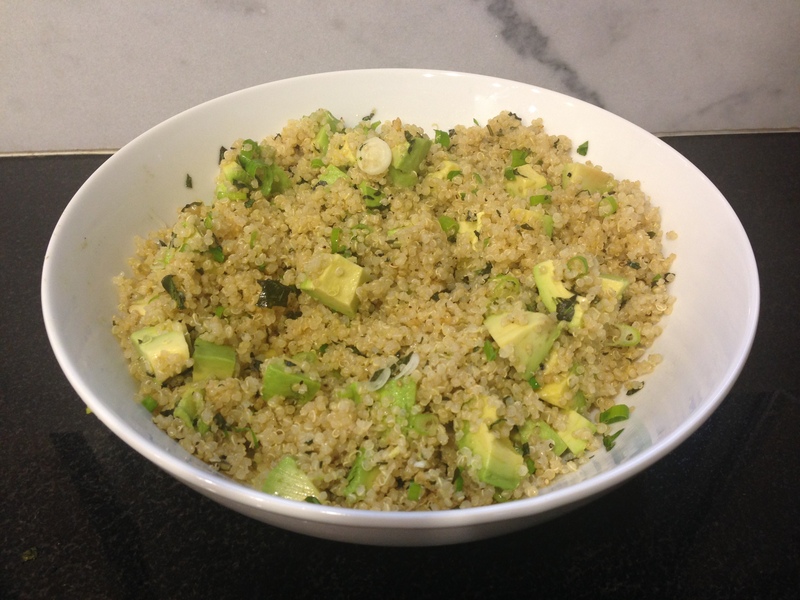 Also, if for some weird reason you are not a fan of quinoa, this recipe will work with brown rice or couscous. 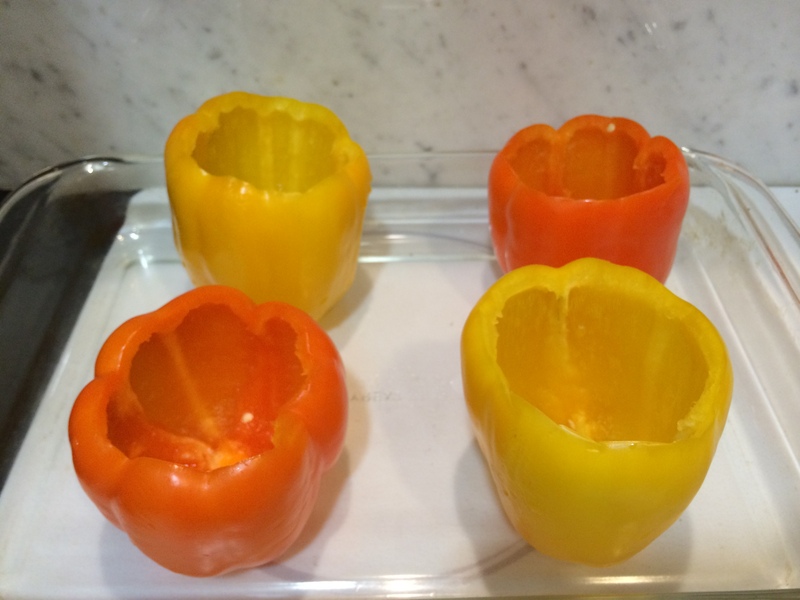 Place peppers in a glass baking dish. Fill with 1 inch of warm water. With a large spoon, stuff peppers with quinoa mixture. Be liberal with the quinoa, make sure the peppers are fully stuffed. Bake for 1 hour or until the pepper is soft and the quinoa is browned. Let cool for 15 minutes and enjoy! Preheat oven to 425. Wash and Dry broccoli. Chop Broccoli florets off the stems and into smaller bite sized pieces. In a medium bowl toss broccoli with a olive oil, salt, pepper and chili flakes. With your hands, massage olive oil into the heads of the florets ensuring a crispy finish. Place Broccoli on a baking sheet covered with tin foil or parchment paper. Roast for 15-20 minutes until broccoli is slightly browned and crispy. Remember to share as this dish can be quite addicting! Slice the Squash into thirds, the long way. Grill on low for about 8 minutes per side. You want the squash to still be a little firm, to hold it’s shape. While grilling, thinly slice Humboldt Fog Goat cheese. While the squash is hot, place a healthy amount of cheese on the squash. Let sit for 5 minutes. 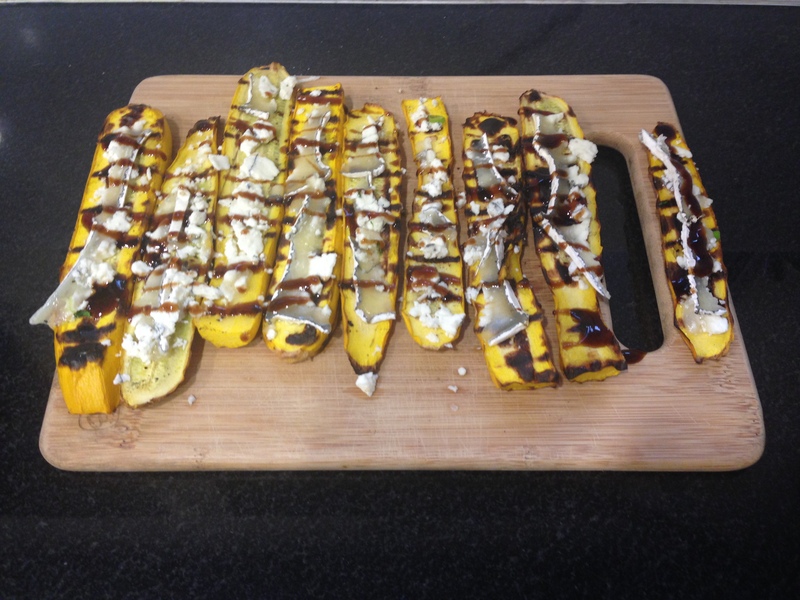 Drizzle balsamic glaze or reduction over the top and enjoy! Add 1 Cup of rinsed Quinoa and 2 Cups of liquid into a sauce pan and bring to a boil. 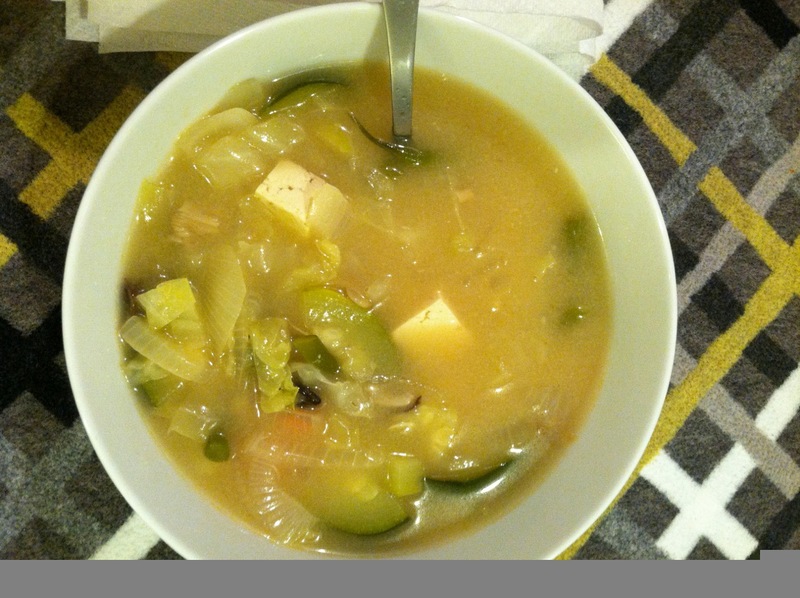 I use 1 Cup of water and 1 Cup of Vegetable stock to add flavor. I also add Olive Oil and a pinch of salt. Once the water is boiling, turn to low and cover for 15 minutes or until all liquid is absorbed. In a small bowl, add 3-4 Tablespoons of Olive Oil, 1 Teaspoon of Pepper and 1/2 Teaspoon of salt. Rinse 1 1/2 Cups of Basil Leaves, chop finely and mix into sauce. Creating a fresh and delicious pestoey/chimichurri sauce. Once Quinoa is cooked, put it in a large glass bowl and toss it with the Chimichurri Sauce. Finely chop 2 Scallions, peel and cube 2 ripe avocados. Toss together and enjoy this delicious and nutritious dish! Quinoa is a complete protein, so this can act as your main dish as well as your grain. Wash, Slice and Half 1 large flavorful tomato. The tomato juices double as a component to the salad dressing. Rinse and rough chop about 4 Cups of Spinach. Finely slice 1/4 of a red onion. Add the juice of 1 Lemon. Sprinkle a pinch of salt over the spinach. Grind about 1/2-1 teaspoon of pepper into the salad. Give the salad a drizzle of about 2 Tablespoons of High quality olive. Toss with your hands. 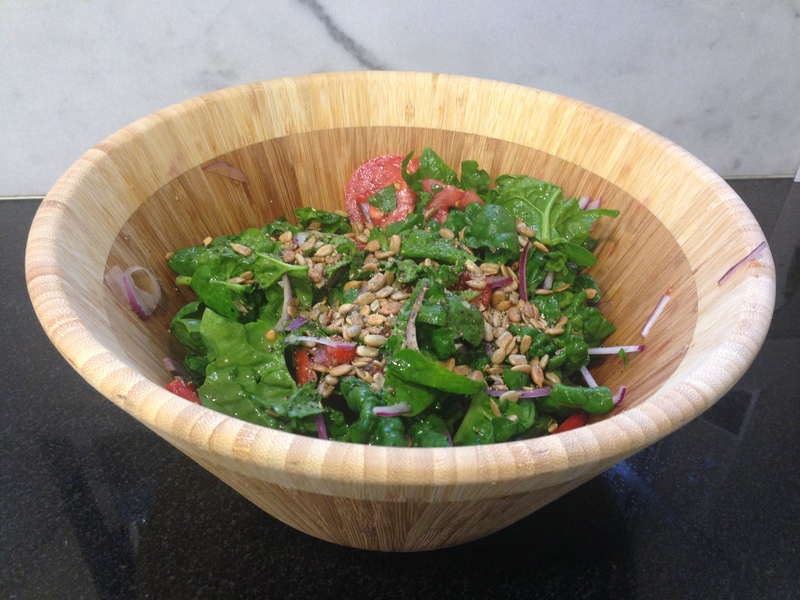 Add a handful of sunflower seeds and voila, your salad is ready! Enjoy The Taste of Summer!! 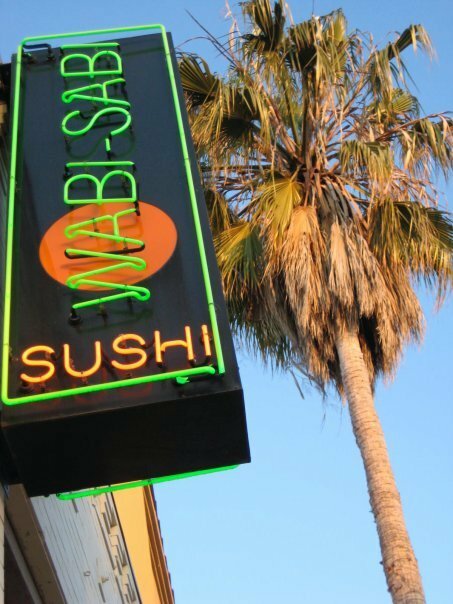 Wabi-Sabi on Venice’s Abbot Kinney has amazing side dishes such as pan fried sweet miso eggplant, chili garlic edamame, and kale salad. Of course they offer the signature vegetarian sushi: vegetable and cucumber rolls. In my eyes the star Wabi-Sabi dish is the huge Vegan Mushroom Miso soup with Tofu, vegetables sautéed in spicy garlic black bean paste and last but not least delicious cubes of crispy rice. This dish is enough to feed a small family, but you’ll find it hard to share. It is so delicious, rich and versatile that it is hard to stop eating. It is a must for vegetarians and vegans alike. If you’re hungry for something sweet- the green tea creme brûlée is to die for. 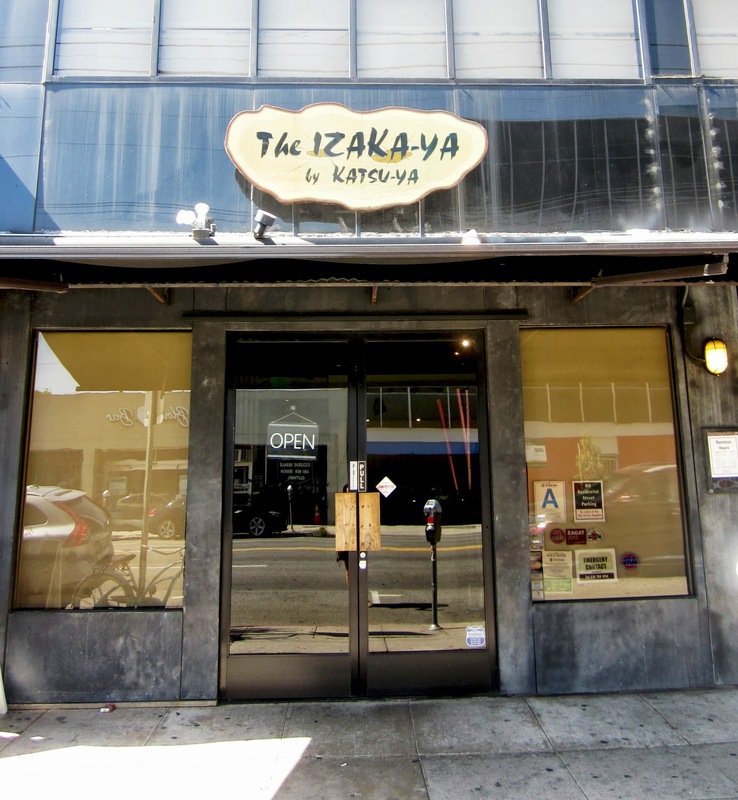 The Izaka-ya in Manhattan Beach or on Third Street in West Hollywood have such high quality sushi rice that their simple Avocado Roll is absolutely delightful. They have a tapas menu, full of ornate and delicious small plates; such as the kinpira lotus root, agedashi tofu, shishito peppers, sauteed pumpkin, cucumber salad, etc. The best vegetarian item on the Menu is the Tofu Chample; perfectly cooked vegetables with delicious soft tofu. I thoroughly recommend this spot! Not to mention my boyfriend claims it has the best (fish) sushi in LA! Last but not least is Shikibu, a restaurant practicing macrobiotic rules by solely using Brown Rice for sushi. Shikibu has simple sushi for vegetarians, including Carrot Kimpira, mixed vegetable and avocado rolls. They have a delicious carrot ginger dressing which can be found on the Tofu Salad, a crisp simple salad with delicious slabs of fresh tofu. 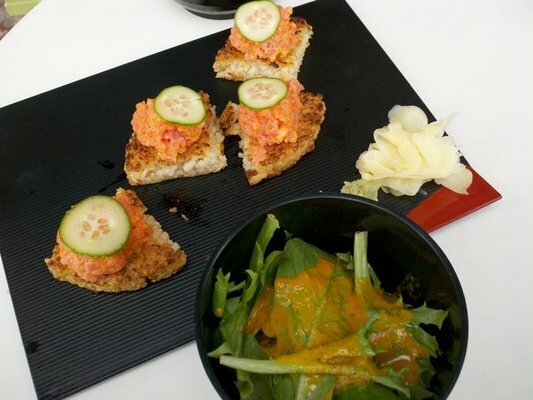 The shining star at Shikibu is the Crispy Rice with Carrot Kimpira, it is crunchy, spicy, and has a tiny homemade pickle on top…. Perfection… OISHII DESU!!! 4. Taste for flavor– add splash of soy sauce if necessary. Fresh, delicious, filling, versatile. Kale. Tender Greens is a great Mini Chain Restaurant in Southern California. They serve organic gourmet food in a production line style. My Personal Favorite dishes at Tender Greens are the Simple Kale Salad w/ Roasted Vegetables with a side of Mashed Potatoes or the Tomato Soup. The Kale is tossed with a Parmesan and Lemon Garlic dressing, emulating a caesar dressing. The Roasted Vegetables are a medley of seasonal vegetable. The mashed potatoes are something special, so delicious, unforgettable. 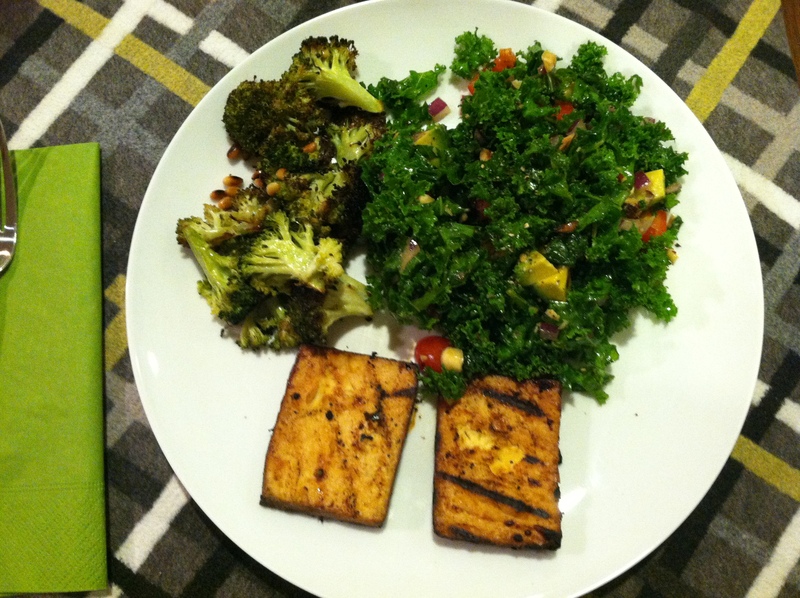 This week I played with Vegan Recipes, focusing on fresh vegetables from the farmer’s market and lean vegan proteins. Last night for a dinner party, I prepared the vegetables and Tofu and let my friends bring their own Chicken to grill. That way everyone is happy, the Vegetarian doesn’t have to touch or attempt to cook meat and the meat eaters are able to properly cook their meat!! (I’m learning to expand me knowledge of cooking meat, but not quite there yet!) 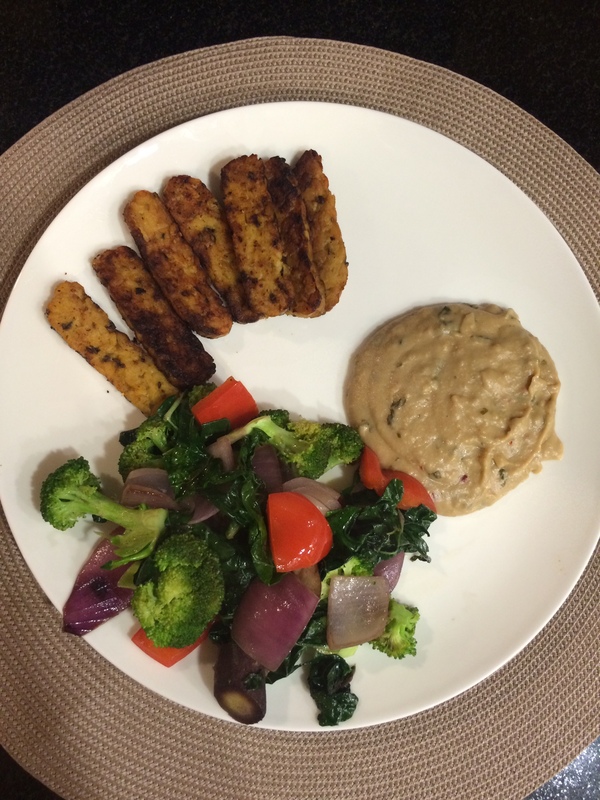 Please enjoy recipes for last night’s Flexitarian Meal!! Rinse and Dry Kale. Cut the Stalk out of each leaf. Julienne cut the Kale (the finer the pieces the more it’s able to moisten and break down). 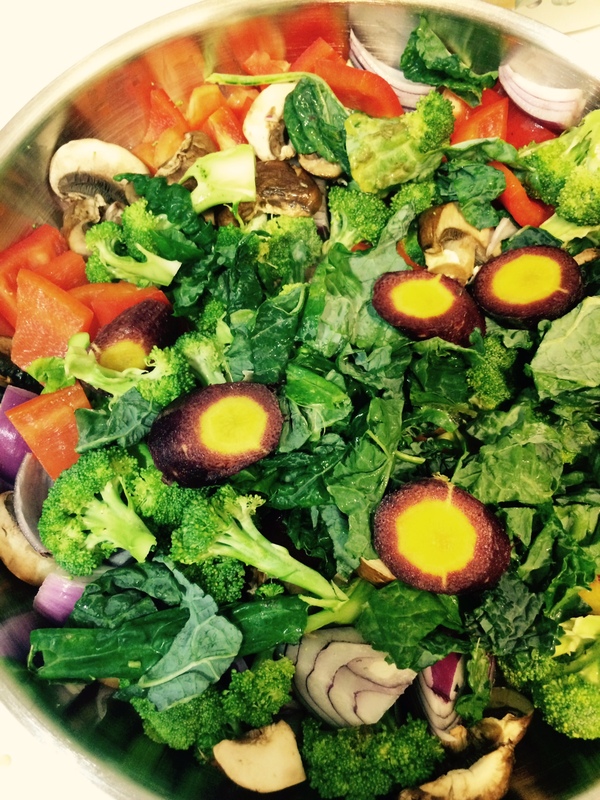 Place Kale in Large bowl, add lemon, Soy Sauce, Olive Oil, Salt and Pepper. Massage liquids into to Kale using your hands. Massaging the kale will make it more tender and flavorful. At this point you can store kale in the refrigerator for up to 5 days, adding vegetables for a salad or mixing w Eggs, adding to stir fries, there are endless uses for Kale, especially when it is pre-prepped. For this salad, the next step is to add all the chopped vegetables and nuts and toss. Enjoy! Chop florets off the stem, cut the large florets in half. Marinate and Grill it up!!! Hope you enjoy this Delicious Flexitarian Menu!